The salamanders and frogs in East Brunswick got an early start to their migration season by crossing this week on February 15. David Moskowitz found spotted salamanders, wood frogs, dozens of spring peepers, and one wood frog crossing the temporarily closed section of Beekman Road in the early evening rain. “This is the earliest they’ve ever moved – by about a week – in the 12 years I’ve been closing the road,” said Moskowitz. East Brunswick has closed the road for a few nights each late winter/early spring when conditions are just right. While all amphibian species are vulnerable, spotted salamanders are a species of special concern in New Jersey. Conserve Wildlife Foundation partners with certain municipalities and the Division of Fish and Wildlife’s Endangered and Nongame Species Program on salamander crossings in northern New Jersey. This is a key initiative among CWF’s amphibian projects. The East Brunswick crossing offers the best opportunity for the public to take part and see these salamanders and frogs up close. Check their website for the next expected crossing and share the road with a salamander! Waterloo Village in Byram Township, Sussex County is more than a tourist attraction and local gem, it is also home to the largest cross-road amphibian migration in New Jersey. Each spring, frogs, toads, and salamanders stir from their hibernation to make their way to their breeding sites. Some of these sites, like the one at Waterloo, are vernal pools – small, temporary bodies of water that appear in early spring as snow melts and rain and groundwater gathers, and disappear throughout the summer as they evaporate. The ephemeral nature of these pools can’t support fish, which would prey on amphibian eggs and larvae. Vernal pools therefore provide some protection for amphibian offspring, with many species such as wood frogs and spotted and Jefferson salamanders – both of which are listed as New Jersey species of Special Concern – relying exclusively on these vernal pools for breeding. The greatest challenge for amphibians breeding at Waterloo Historic Village is crossing Waterloo Road. Living in the most densely population state takes a toll on many species of wildlife in the form of habitat loss, degradation, and fragmentation. Each year, many amphibians become victim to vehicular collision as they move from their hibernation sites across Waterloo Road to the vernal pool in which they reproduce. Amphibians may be disproportionately affected by vehicle-caused road mortalities compared to other wildlife because of their tendency to migrate en masse to breeding sites. These annual road mortalities can have devastating effects on amphibian population sizes, especially for the local at-risk salamander populations. In fact, as little as about 10% annual risk of road mortality in spotted salamanders can lead to the local extinction of an entire population. Wood Frog eggs. Photo courtesy of MacKenzie Hall. To address this problem, the Conserve Wildlife Foundation of New Jersey (CWF) and the New Jersey Endangered and Nongame Species Program (ENSP) organized amphibian rescue efforts. Since 2002, dedicated volunteers have assisted frogs, toads, and salamanders across Waterloo Road during the busiest migration nights. This aid has proven effective in reducing amphibian road mortalities, but it is not a permanent solution to the problem. Efforts are underway to construct under-road tunnels to help guide amphibians safely across Waterloo Road. These tunnels will provide safe passage for these critters throughout the breeding season, including on their migration back into the woods where they will hibernate. Since this return migration is more sporadic and less weather-dependent than migration to the vernal pool, it is much harder to protect amphibians as they make their way back to the forest. This year, CWF scientists have begun the initial phases of research to understand current amphibian population sizes and the impact of vehicle traffic on these animals at Waterloo. Scientists and volunteers have been out 7 days a week since amphibian migrations began in late February to tally daily roadkill on Waterloo Road. This study will be used to evaluate changes to frog, toad, and salamander populations as the under-road amphibian tunnels are installed. CWF scientists have also conducted egg mass counts in the vernal pool at Waterloo Village to estimate the current population sizes of the different amphibian species in the area. Having this knowledge will allow CWF to improve on future projects to minimize road-related human-wildlife conflicts. Spotted Salamander egg mass. Photo courtesy of MacKenzie Hall. Along with improving conditions for amphibians in this location, CWF’s work at Waterloo Village will serve as an example of New Jersey statewide initiatives to reconnect wildlife habitat as a part of the Connecting Habitat Across New Jersey (CHANJ) program. The goal of CHANJ is to make our state landscapes more permeable to wildlife movement so that all of New Jersey’s residents – human and wildlife – will have the space they need to thrive. In an effort to bring people and wildlife together in a positive way at Waterloo Village, CWF scientists are leading educational walks for the public and local schools. Through hands-on interaction, local residents can learn about and appreciate the remarkable wildlife right in their own back yards and what they can do to support conservation efforts. All New Jerseyans can help wildlife this season by planting native plants for their gardens, building bat boxes where bats can roost, and, of course, by keeping an eye out on the roads, especially on warm, rainy nights when amphibians might be migrating. Allegra Mitchell is a biologist for Conserve Wildlife Foundation of New Jersey. Posted in Amphibians, Education, Events, Get Involved, Habitat Restoration, Outdoor Recreation, Volunteer Programs, Wildlife News, Wildlife Protection | Comments Off on What’s Happening at Waterloo? Spring Peeper photo by Andrea Proctor. We all know that “April showers bring May flowers,” but the earlier rains of March stir up beauties of a different kind. When the first spring raindrops hit the barely-thawed ground and night falls on the forest, frogs, salamanders, and toads emerge from their winter burrows. These amphibians – the spotted salamanders, wood frogs, spring peepers, and others – are anxious to get to their breeding pools and lay their eggs. The waters that they choose are called vernal pools because they fill with rainwater, snowmelt, and rising groundwater in early spring but then dry up as summer advances. The pools are thus temporary and cannot support fish, meaning fewer predators for the amphibian eggs and young. In the northeastern United States, vernal pools are home to over 500 species. In New Jersey, these pools are critical habitat for amphibians, reptiles, invertebrates, migratory waterfowl, raptors, and songbirds. All 14 of New Jersey’s frog species use vernal pools to breed and two endangered salamander species breed exclusively in vernal pools, including Cape May’s eastern tiger salamander. The new generation of amphibians must race to complete metamorphosis and leave the vernal pool before the water does. Under perfect conditions of warm, thawing, nighttime rains, there may be hundreds or even thousands of amphibians moving at once toward the same breeding pool. The darkness and the rain allow them to move stealthily over the landscape, hidden from predators like the owl and raccoon. CWF biologist Kelly Triece educates participants on the natural resources of Waterloo. CWF biologist Kelly Triece looking for wildlife in the vernal pool. Spotted Salamander Eggs! Photo by Kelly Triece. Green Frog photo by Kelly Triece. Examining the wildlife found in the vernal pool after dark. 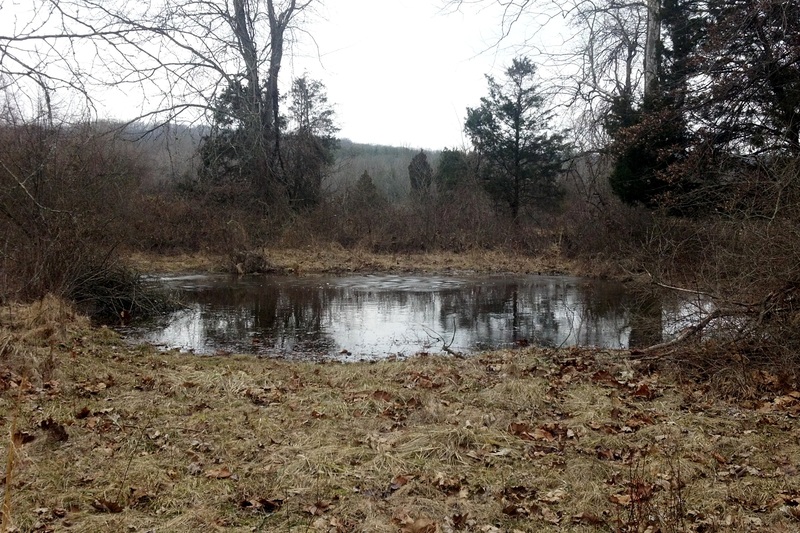 This small vernal pool in Hopewell is ready for things to start hoppin’. For the 98 volunteers signed on to help with this year’s amphibian road-crossing efforts, yesterday brought on the first flurry of excitement. Forty degrees! The promise of nighttime rain! Saturday’s soaker had helped to get the ground thawing, though many of the amphibians’ breeding pools were still capped in ice. The conditions weren’t going to be perfect, but surely some eager salamanders would be enticed to come out from their winter burrows and set off on migration. And when their tiny feet hit the pavement of peril, we were gonna be there gosh dernit! So our “scouts” got ready for night (and rain) to fall, to go check on a dozen or so road-crossing hot-spots in northern and central NJ. Then, as volunteer Phil Wooldridge of Warren County put it, we experienced a little deja-vu. The rain started later, the temperature was colder. North of Route 80, snow and sleet fell instead. We amphibian crossers have gotten used to the shakiness of weather forecasts, and to the somewhat complex combination of triggers that set an amphibian migration in motion. At any rate, we basically got skunked last night. The only sign of life came from Hampton, in Sussex County, where Sharon and Wade Wander found a single Jefferson salamander crossing the road to his ice-covered breeding pool. Tough little salamanders, those Jeffs. Our first one of 2012 came out during a wet snowfall, too, around 2:00 am on February 24th. The town of East Brunswick was also counting on last night’s forecast when they decided to close Beekman Road – a town road bisecting an amphibian migration path. The town’s Environmental Commission has coordinated the closure for the past 10 years to protect the spotted salamanders, wood frogs, and other migrants on 4 to 10 nights every spring (read about it here). Even there, only one male spotted salamander was seen making his way to the pool. So, we’ll keep doing our best to predict the amphibian migration and to be in the right places when it happens. Clearly the big long nights are still in front of us. To learn more about our Amphibian Crossing Project and experience the migration through video, please visit our “Amphibians Crossing!” webpage.